An ancient, dolphin-like marine reptile resembles its distant relative in more than appearance, according to an international team of researchers that includes scientists from North Carolina State University and Sweden’s Lund University. Molecular and microstructural analysis of a Stenopterygius ichthyosaur from the Jurassic (180 million years ago) reveals that these animals were most likely warm-blooded, had insulating blubber and used their coloration as camouflage from predators. Johan Lindgren, associate professor at Sweden’s Lund University and lead author of a paper describing the work, put together an international team to analyze an approximately 180 million-year-old Stenopterygius fossil from the Holzmaden quarry in Germany. Researchers identified cell-like microstructures that held pigment organelles within the fossil’s skin, as well as traces of an internal organ thought to be the liver. They also observed material chemically consistent with vertebrate blubber, which is only found in animals capable of maintaining body temperatures independent of ambient conditions. Lindgren sent samples from the fossil to international colleagues, including Schweitzer. The team conducted a variety of high-resolution analytical techniques, including time-of-flight secondary ion mass spectrometry (ToF SIMS), nanoscale secondary ion mass spectrometry (NanoSIMS), pyrolysis-gas chromatography/mass spectrometry, as well as immunohistological analysis and various microscopic techniques. Lindgren’s lab also found chemical evidence for subcutaneous blubber. “This is the first direct, chemical evidence for warm-bloodedness in an ichthyosaur, because blubber is a feature of warm-blooded animals,” Schweitzer says. Taken together, the researchers’ findings indicate that the Stenopterygius had skin similar to that of a whale, and coloration similar to many living marine animals – dark on top and lighter on the bottom – which would provide camouflage from predators, like pterosaurs from above, or pliosaurs from below. “Both morphologically and chemically, we found that although Stenopterygius would be loosely considered ‘reptiles,’ they lost the scaly skin associated with these animals – just as the modern leatherback sea turtle has,” Schweitzer says. “Losing the scales reduces drag and increases maneuverability underwater. “This animal’s preservation is unusual, especially for a marine environment – but then, the Holzmaden formation is known for its exceptional preservation. This specimen has given us more evidence that these tissues and molecules can preserve for extremely long periods, and that soft tissue analysis can shed light on evolutionary patterns, relationships, and how ancient animals functioned in their environment. The work appears in Nature, and was supported in part by the National Science Foundation (INSPIRE grant EAR-1344198) and the Packard Foundation. 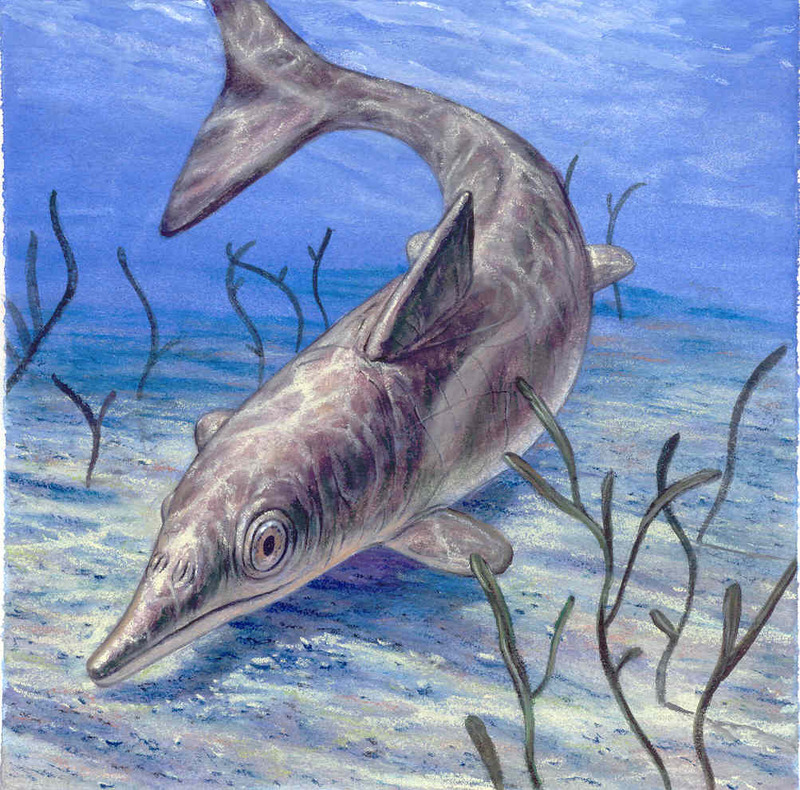 Ichthyosaurs are extinct marine reptiles that display a remarkable external similarity to modern toothed whales. Here we show that this resemblance is more than skin deep. We apply a novel multidisciplinary experimental approach to characterise the cellular and molecular composition of integumental tissues in an exceptionally preserved specimen of the Early Jurassic ichthyosaur Stenopterygius. Our analyses recovered still flexible remnants of the original scaleless skin, comprising morphologically distinct epidermal and dermal layers. These are underlain by insulating blubber that would have augmented streamlining, buoyancy and homeothermy. Additionally, we identify endogenous proteinaceous and lipid constituents, together with keratinocytes and branched melanophores that contain eumelanin pigment. Distributional variation of melanophores across the body suggests countershading, possibly enhanced by physiological adjustments of colour to enable photoprotection, concealment and/or thermoregulation. Ichthyosaur convergence with extant marine amniotes thus extends to ultrastructural and molecular levels, reflecting the omnipresent constraints for their shared adaptation to pelagic life. Some have argued that the term “reptile” is not technically useful, especially when applied to creatures such as dinosaurs. Perhaps these extinct marine creatures are also different enough from our usual conception of reptile that the term is not properly or usefully applicable. Great to see more soft tissues and biomolecules being discovered. They tell us so much more than we expected to learn about extinct animals known only from fossils. David, thanks for bringing up that question. Classification is so flexible today that chickens too are reptiles because chickens are dinosaurs. The general public, not known collectively for extensive scientific knowledge, might just give up altogether trying to follow the latest taxonomy trends.